The plan has always been: allege public schools are failing, propose solutions that hurt public schools, criticize their struggles, propose more solutions that hurt them, etc., etc. That way, schools have fewer and fewer resources, so eventually they can be moved to the private sector where they belong, where profits can be had. After 30 years of these ‘reforms,’ Michigan schools were recently predicted to become among the nations lowest performing if current trends hold. This circle has always included charter schools, vouchers, cyber schools, and always cuts to teacher and every other school employee’s retirement, medical benefits and pay. As well as funding cuts that have resulted in an ever-increasing number of school districts in deficit. The Mackinac Center has always been front and center in this, proposing any solution so long as it includes weakening pubic schools. Take for example, the problem of funding road repairs. The solution, cut schools. 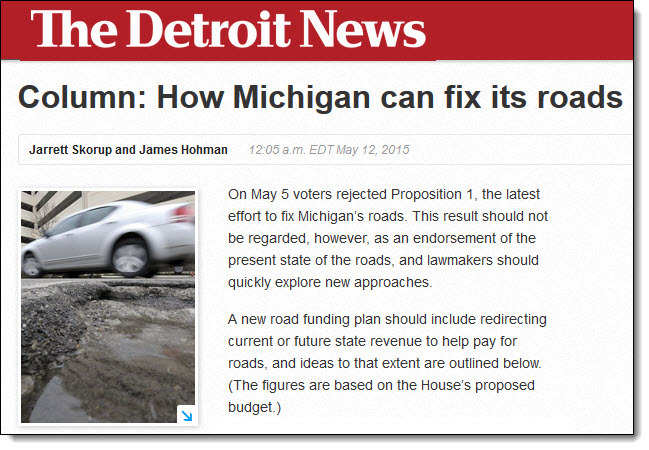 In a recent Detroit News Op Ed, the Center’s Jarrett Skorup and James Hohman recommended cutting $892 million from schools to fix pot holes. $255 million from public schools and $637 million from universities and colleges. As MEA Capitol Comments points out, this from the same group that poses as a friend when it’s time to urge them to quit their union. 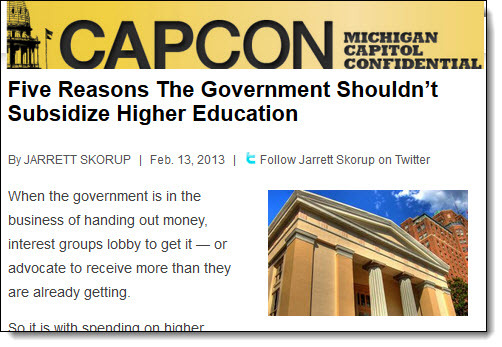 Cutting higher education isn’t a new idea at the Mackinac Center. The Center has been advocating for the privatization of the University of Michigan since its very earliest days. This kind of reasoning is enough to get a person a policy analyst job at the Mackinac Center. This has always been about political strength and corporate market share; it’s never been about you.